We are very pleased to announce that for the first time ever, Artemis Art will be participating in the upcoming Art Expo Malaysia 2012, September 27 – 30, 2012, at the MATRADE Exhibition & Convention Centre (MECC). 60 exhibitors from 20 countries will be participating this time around, including 19 exhibitors from Malaysia. As a new gallery, this event is definitely the highlight of our first year in operation, and it is indeed an honor to be part of this international art exposition. This year’s event marks the sixth year this expo has been organized, and is the culmination of the 1MCAT (1Malaysia Contemporary Art Tourism) Festival, an initiative of the Ministry of Tourism. One of the highlights of this year’s Art Expo is The Young Contempo Auction (TYCA), which will be held on September 29, starting at 4:00pm. This is the first auction of its kind in Malaysia, focusing entirely on the works of emerging Malaysian artists. Check out the link provided for a peek at what works will be up for grabs. Artemis Art will be at Booth 25, and for this event, we have selected a number of works from the Indonesian and Malaysian emerging artists whose works we display at the gallery, such as those fromÂ Aan Gunawan,Â Andi Firmanto,Â Antoni Eka Putra,Â Dedy Sufriadi,Â Ng Kim Heoh, andÂ Riduan. In addition to art on canvas, we will also be displaying sculptures by Zheng Yuande, a senior Malaysian artist, who exhibits across the region. Artemis Art is indeed honored that Yuande selected us to be a platform to display his works. Admission to the expo is free, and the doors open daily from 10:30am, running until 7:30pm, except on September 30 (the last day), when the expo closes at 6:00pm. For those who may have difficulty getting to MATRADE, located off of Jalan Duta, the expo organizers will provide a free shuttle bus service between MATRADE and KL Sentral throughout the four-day exposition. As Artemis Art will be participating in the expo, the gallery will be closed from Wednesday, September 26 through Sunday, September 30. We will resume our regular opening hours on Tuesday, October 2. If you plan to visit Art Expo Malaysia 2012 – and we think you definitely should – don’t forget to drop by Booth 25 and view the ensemble of artworks we have put together. The month of October promises to be a very busy one for us, with two group exhibitions planned for the month. The first is Pieces of Joy, a group exhibition showcasing the works of nine young artists with learning difficulties. This exhibition is a collaboration between Artemis Art and Tutti Art Club, where eight of the young artists are tutored by artist Tan See Ling, the club’s founder. See Ling, as you may recall, was one of the three artists who participated in Our Love, Our Passion, Our GratitudeÂ earlier this year. This exhibition will run for two weeks, from Sunday, October 7 until Sunday, October 21, and the official opening has been planned for October 7. For people with learning and developmental difficulties, such as Autism and DownÂ Syndrome, Â mundane everyday tasks that most of us take for granted may be insurmountable. However, they often exhibit talents in other areas – art being one of them. Among other things, it is this talent that we aim to highlight, and the fact that with early detection and proper nurturing, persons with learning and developmental difficulties can lead almost normal lives. Each of the artists will have between 3 to 5 art pieces on display.Â This exhibition gives these young artists an opportunity to showcase their works through a platform allowing them to share their artistic expressions with the general public. The success of this event will definitely be a big boost to their confidence, which in the longer term enables them to continue pursuing their artistic dreams and endeavors, and will show that we are still a caring society that is keen on helping in whatever way possible. More details about the this exhibition, and the artists participating, will be provided in a future post. We do hope that you will plan to take some time off to come view Pieces of Joy in October. The second exhibition coming up, immediately after Pieces of Joy, is Emergence, a group exhibition featuring six young artists. For some of them, this will be the first time their works have been featured in a formal exhibition. 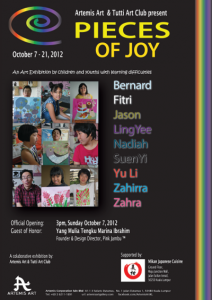 The exhibition will commence on Wednesday, October 24 and will run for two weeks, ending on November 7. There are many definitions of what an ’emerging’ artist is. Some are of the opinion that emerging artists are those who are somewhat established and are starting to get their name recognized within art circles, particularly among collectors. Â For others, ’emerging’ artists are well-established ones not quite at the stature of senior or master artists. There is no right or wrong definition, and it all depends on how involved one is in the art world. We see it somewhat differently -Â a few of the artists in this group exhibition have exhibited before, some never have in any formal exhibition, and one is somewhat established outside of Malaysia, but is pretty much unknown at home.Â To us, therefore, these six artists are emerging intoÂ the world of Malaysian art. The participating artists are Azimuddin Abd Manaf, Hafiz Hajeedar, Harold “Egn” Eswar, Lyia Meta, Shyevin S’ng, and T.W. Chang (better known as Skinner). A variety of artistic styles will be displayed during this exhibition, covering a wide spectrum of what is generally considered ‘contemporary’. With the variety of works that will be on display, we hope to be able to attract a wide spectrum of art lovers. More details about each artist will be posted in the coming days, as the exhibition draws nearer. We do hope that you are able to take some time out in support of these young artists.